Welcome to my resource page for affiliates. My product "Fat Loss For Keeps" is one that you can feel confident promoting to a very large target audience of people interested in eating right and getting rid of those unnecessary pounds that push a healthy lifestyle just beyond reach. When you promote "Fat Loss For Keeps" as an affiliate you will be making a healthy 75 percent commission on every sale that you refer. The book currently sells for $37. This means you get to keep approximately $24.92 of every sale (once my sales processor takes its small cut). Why Starve Yourself to Get Slim? 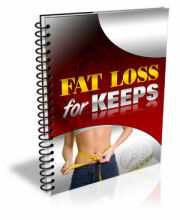 We have all heard advice, most of it fairly useless, about how best to lose those extra pounds. For years it was assumed that if you ate less food, you would lose weight, look better, feel better, and be healthier. But most weight-loss diets are far from being nutritionally sound, and restricting your calorie intake below a certain level can cause your metabolism (your body's engine) to go into 'starvation mode', which in turn causes your body to store fat instead of shed it. The bottom line is that starving yourself in the hope that this will make you slimmer is not the answer. After all, what you would really like to achieve is a strong, lean, and healthy body, isn't it? The real key to weight loss, weight maintenance, and a healthier body is proper exercise. Forget long, slow steady state activities like walking, jogging, or cycling. Although these activities are great as part of an active lifestyle, they will not increase the metabolic rate after your exercise session has finished. Your program should contain mostly strength training exercise and the focus should be on training hard enough to increase your overall volume of toned muscle tissue. Why? Because it is muscle that burns off unwanted fat. Your fat burning machinery is your lean muscle tissue, so the more toned muscle you have on your body, the greater amount of fuel (calories) you will burn. You will be burning this increased fuel not only when you are exercising but when you are sleeping or parked on the couch watching television. Ideally, your eating should involve 5-7 small meals every 2-3 hours throughout the course of the day. These meals should contain around 20 grams of protein as the center piece. Add raw and cooked vegetables, and you have a perfect small meal that will keep you satisfied for several hours. The secret to eating this way is to prepare your meals the day before and take them wherever you go during the day. Then you will not be tempted to eat things that will not help you reach you fitness/weight loss goals. This is challenging to get right when you start off, but as time goes on you will find it gets easier and suddenly it is a habit that doesn't require thinking about. You just do it. Remember you are unlikely to get it perfect; improvement is always a good goal to shoot for. The best strategy for maintaining a healthy, trim body is to combine good nutrition and proper exercise. Starving yourself is not the answer - moderation and a strength training exercise program will help to burn off unwanted body fat. With this combination, your body will burn the calories you consume and turn them into energy instead of storing them as fat. You will find that once you begin a regular exercise program you need to eat more quality food to supply the healthy lean muscle with the energy it needs to keep you energized throughout the day. To get started on your own proper nutritional diet, and get the full theory of the small-portion eating plan, check out ex-bodybuilding champion Carolyn Hansen's product Fat Loss For Keeps and learn how to eat in such a way that weight loss never becomes something you need worry about again. Weight Loss Minus The Starvation Do you find that dropping a few pounds is incredibly hard? Even if you are clearly overweight? Well, you are hardly alone. The plain fact of the matter is that effective weight loss is not easy because our basic biology works against the dieting frame of mind. Weight loss can be frustrating for so many reasons, but perhaps the toughest one is having to accept how difficult it is to lose the weight when putting it on in the first place was so darn easy! Every day we are faced with the promises of thousands of diets - fad diets, detox diets, the list goes on and on - that advertise weight loss practically overnight. Many diet pills guarantee a suppressed appetite - supposedly helping to secure the weight loss you are looking for. In reality, the majority of diets and diet pills are quite unhealthy for you. New research, and even common sense, suggests that losing weight need not be nearly as difficult as most of us make it out to be. The key to easy weight loss is to begin by looking at what you eat on a daily basis. Not how much you eat, but what you are actually eating. Inventory your daily food intake for a week. If you are overweight, or you have recently gained weight, your weekly inventory is likely to show you that you eat more than you realize, and that the foods you eat are saturated in fats and processed sugars - both of which are the leading causes of obesity. (You do not need to eliminate your entire fatty intake, since your body actually needs a little to function properly.) For most people, analyzing their food intake is fairly challenging. You may realize that you are overweight, or you simply want to lose a few pounds, but you do not want to admit that it is nobody's fault but your own that you are currently heavier than you ought to be. This is perfectly normal, but the only way to make any headway is to accept that there is a problem and you are the one behind it. The flip side, of course, is that if you are the cause of the problem, you are also the solution, since you are in charge of all aspects of your body and its nutritional intake. This means that you can control, and change, both what you are eating and the quantity. So, now that you have analyzed your food intake, and are in full control of your eating habits, it is time to start losing weight. Simply put smaller portions on your plate, eat slower, and eat more frequently throughout the day. Try eating 5 or 6 small meals over the course of the day, rather than the usual three courses we are taught to eat. The combination of these three eating habits will increase your metabolism, which in turn will increase the amount of fat your body burns. The result is completely predictable: weight loss! Exercise is another key element in your strategy to lose weight. Yes, you can lose weight by simply changing the way you eat. But exercise builds muscle, and keeps your heart and overall health in check. It will also increase your metabolism, so that you burn excess calories faster. So stay away from fad diets, and instead start eating a diet full of vegetables, fruits, whole grains, poultry, and fish, and you will soon begin to lose weight and become healthier. To get started on your own proper nutritional diet, and get the full theory of the small-portion eating plan, check out ex-bodybuilding champion Carolyn Hansen's product Fat Loss For Keeps and learn how to eat in such a way that weight loss never becomes something you need worry about again. Turns Out The Best Weight Loss Diet Is A Healthy Diet Try the following. Do a search in Google, or your favorite search engine, on the term "best weight loss diet". What you will see turn up is hundreds of links to diets, all claiming to be the best. Unfortunately, what many of these diets really do is starve you and your body from the kind of proper nutritional diet, and the calories, needed to function properly. Other dieting plans are only temporary fixes, so that as soon as you go back to your normal eating habits you put any weight that you lost right back on. Some of the worst of these plans involve the so-called detox diets that force you to completely starve your body of all nutrients for certain periods of up to 7 - 10 days. Well, I guess if you are looking for a really quick fix, and are simply trying to fit into a dress for an evening, then one of these diets might just work for you - for a very short duration. But most of these diets, as you can probably see by now, are dangerous to your health. Diets that do not attempt to remove food from your plate, and which include plenty of nutrients and minerals, are in general good for you. Healthy diets resemble more an eating plan, or a lifestyle change, and do not really appear to be diets at all, even if we still use the term diet to describe them. So, the best weight loss diet, or program, really involves a plan that includes a healthy selection of foods, and a lifestyle change. For example, by learning to put less food on your plate and eating slower, you effect a lifestyle change that virtually guarantees a gradual but ongoing weight loss with minimal interruption to your current dietary habits. This technique re-trains your stomach, and your brain, and gives your body time to actually process the food that you are eating. It lessens the chance of overstuffing yourself, which often happens simply because you have added too much food to your plate. Once you get this "smaller plate" practice down, you can start eating more frequently over the course of the day. This step may come naturally, because when you cut your portions down, and stop eating when you are full, you will naturally get hungrier more often. A good plan is to have your three (smaller) meals, along with a healthy ½ a meal between breakfast and lunch, and again between lunch and dinner. Meals like ½ a serving of oatmeal, a bowl of fruits, some fresh vegetables - all are good for these "snack" times. So now, you know what to do for a healthy diet, but possibly not what to eat. Vegetables, fruits, poultry, and fish provide you with the majority of vitamins and minerals that your body needs. Carbohydrates, surprising as it may be, are another source of nutrients required by your body. Cutting back on the carbohydrates is a good idea, but you certainly do not want to completely eliminate them from your diet. Provided that your 5 or 6 meals a day include vegetables, fruits, poultry, fish, proteins, and a little in the way of carbohydrates, you will be enjoying a healthy diet. This is the best way to lose weight, and is the best way to stay healthy after your weight loss. Eating this way trains your body and mind for a healthy lifestyle, and will even help you to live a much longer life. To get started on your own proper nutritional diet, and get the full theory of the small-portion eating plan, check out ex-bodybuilding champion Carolyn Hansen's product Fat Loss For Keeps and learn how to eat in such a way that weight loss never becomes something you need worry about again. Healthy Snacks To Promote Fat Loss One of the best unkept secrets today in the fitness industry is the hard won knowledge that eating 5 or 6 small meals over the course of a day is a much better strategy for getting lean and slim than the traditional "3 squares" a day (which for many people, turns into just 2 large meals because they skip breakfast). Yes, skipping meals might seem like a logical way to cut calories and lose pounds, but in fact it works the opposite way to what you might expect since it generally leads to deprivation and overindulgence. It may sound counter-intuitive, but the far better strategy is to eat regularly and more frequently (within reason) to achieve your optimal weight. One of the problems associated with missing a meal is that it can cause your blood sugar levels to decrease. This can predispose us to a pattern of increased eating as the body attempts to correct the dip in blood sugar. For instance, skipping breakfast is proven to cause fatigue, hamper metabolic rate, and increase food cravings elsewhere during the day. The combined effect can contribute to more food intake and, of course, a resultant weight gain. If you are already managing healthy breakfasts, lunches, and dinners, but are still struggling to come up with ideas for "mid-meals", or snacks, here are some simple, easy, quick, and healthy ideas: Apple wedges or banana with 1 tablespoon almond or cashew butter 1 cup cottage cheese mixed with yogurt, berries, and walnuts or pecans A couple hard boiled eggs with carrot and celery sticks and hummus A piece of whole grain or sprouted grain toast with nut butter and berries Fresh sliced pineapple with a handful of macadamia nuts 1 cup cottage cheese with cinnamon, apple slices, and walnuts Protein shot - serving of whey protein powder with ice and water Small salad (1 cup) with 1 oz chicken Peanuts (1 oz) with 1 med orange ½ cup low fat yogurt mixed with ½ cup cottage cheese 1 tablespoon peanut butter with celery or carrot sticks 1 cup milk with 1 serving whey protein powder and ice Celery with any nut butter It is important that you plan ahead so that you are able to get into the habit of consistently bringing mid-meals and snacks to work for the day. If you don't plan ahead, and fail to prepare something healthy and balanced for when you are out and about for the day, or when you are at work, you are going to end up choosing something junky that will work against your goal of building a strong, healthy, and lean body. To get started on your own proper nutritional diet, and get the full theory of the small-portion eating plan, check out ex-bodybuilding champion Carolyn Hansen's product Fat Loss For Keeps and learn how to eat in such a way that weight loss never becomes something you need worry about again. Toss The Diet Pills And Enjoy The Benefits Of A Nutritional Diet In a world that grows increasingly complex every year, we now have hundreds of diets, diet pills, and weight loss programs available for us to choose from. Yes, all of these "programs" are designed to help you get a jump start on your weight loss goals. But not all are created equally effective. It is important to understand that diet pills - or weight loss programs - are not designed to be a lifelong weight maintenance strategy. Instead, they are designed simply as a temporary fix. Unfortunately, many people who are hoping to lose weight and / or become healthy using these plans are not aware that their use will only bring them short term gains. This is not to say that dieting, or taking diet pills, might not be an effective strategy to pursue initially - but you need to keep in mind that sooner or later you are going to have to wean yourself off any plan of this type, and move to a long term strategy - like a fitness program. This is absolutely essential if you do not want to gradually slide back to the point at which you started. The good news is that a proper fitness program will give you results like no diet or pill could ever deliver. A proper mix of strength training, added on top of cardio exercise, in addition to a healthy eating plan, will help you attain your ideal weight and promote a healthy, and much longer, life. This brings us to a discussion of eating plans - let's not call them diets! Eating the proper amounts of nutrients, fruits, vegetables, grains, protein, and so on, and breaking this across 5 or 6 small meals a day, has been proven to be one of the healthiest ways to tackle your daily nutritional requirements. One of the very big benefits to doing this is that there is no calorie counting involved. Nor will you be starving your body of the nutrients that it needs - in contrast to most diets - as you will be cutting your portions to a more manageable size. This makes it easier for your body to digest your food, and in the process builds up your metabolism which, in turn, helps your body to burn excess fat. In addition to spreading your food intake over the course of the day, it is also very important to begin a fitness program which includes at least 30 minutes of exercise on top of whatever activity your daily routine brings. Mix your exercising between cardio and strength training. The combination of these two activities will have two effects: your total volume of muscle tissue will be increased, and that muscle tissue will become leaner. This in turn will lead to an increase in the amount of fat that your body can burn over the course of a day. So, even if you start off with diet pills, or weight loss programs, you now know that the next step involves creating a plan that eliminates the short term effects of diet pills, and which concentrates not on starving your body, but following a sustainable and healthy nutritional diet that you can follow for years to come. To get started on your own proper nutritional diet, check out ex-bodybuilding champion Carolyn Hansen's product Fat Loss For Keeps and learn how to eat in such a way that weight loss never becomes an issue for you to worry about again. No Wonder I Have Trouble Losing Weight I always though that the reason I could not lose weight easily was because I was never prepared to work hard enough for it. At least, I was never prepared to allocate the time to work hard at it, which is something I would have appreciated had I bothered to learn the basics from someone like Carolyn Hansen, ex national bodybuilder champion: http://nickname.fatlossfor.hop.clickbank.net/ As it turns out, half the battle has nothing whatsoever to do with expending any effort to get the weight loss results we might be looking for. What Hansen says is that working out hard, and including strength-training exercises is definitely part of a coherent strategy for arriving at and maintaining your optimum body weight. But so is your diet (nothing too surprising there) and - here comes the revelation - the manner in which you deliver your food to your body over the course of the day. What I discovered after reading her book "Fat Loss For Keeps" is that the trick to zeroing in on your ideal body weight is to eat less, but more frequently, so as to increase the rate at which the body burns the excess calories that otherwise would end up as fat. No wonder, then, that skipping meals and starving myself never produced the results I was looking for. Any weight that I did lose would always come back right after I went back to my regular eating patterns. Well, I will leave it to Carolyn to explain how it all works, and why the smaller-meal eating plan, in combination with strength-training exercises, is the key to better health and an easier time dealing with your weight issues. If I had known about this stuff years ago I would have saved myself a ton of trouble and foregone all those completely unnecessary attempts to starve myself! Here's the URL again for her book "Fat Loss For Keeps": http://nickname.fatlossfor.hop.clickbank.net/ If you don't like the idea of calorie reduction so much when it comes to planning your weight loss goals, then I think you will find what Carolyn has to say is exactly the kind of solid advice that you have been looking for. I know that it has been for me. Hey, This Fat Loss Strategy Might Even Work I don't know how many weight reduction plans I have tried over the years, but I can tell you that they all had one thing in common. None of them worked for more than a few weeks. It turns out that there is a good reason for this, but it involves some basic observations about fat loss that escaped me until I cams across this title: http://nickname.fatlossfor.hop.clickbank.net/ It is a book called "Fat Loss For Keeps' by ex-national bodybuilding champion Carolyn Hansen. It makes sense that someone who had to deal with body issues for several decades as she prepared for contests would pick up a thing or two about the topic of fat loss. Have you seen some of those bodybuilders? They go on stage with as little as 2 percent body fat. That doesn't happen by accident! Of course, that kind of fat loss is extreme, and it is not the focus of Carolyn's book. But the basic techniques for losing the fat are the same, and there is some real eye-opening stuff delivered in the book. Certainly enough for me to think that what she presents is a solid plan for getting healthier by focusing on the right kind of exercise regimen, and going at the dietary side of things by replacing the regular eating plan of 3 large meals a day with twice that number of smaller meals spread out over the course of the day. Why bother to increase the number of times you put food into your body? Because it leads to less overall storage of excess fat in the body. I will leave it to Carolyn to explain how it all works, and you can get the full story in her book, which can be found here: http://nickname.fatlossfor.hop.clickbank.net/ The bottom line is that here is a solid plan for lowering the fat levels in your body, and maintaining those lower levels. The best part is that it is not one of those strategies that come to a screeching halt after the first few weeks when the motivation to continue some level of fasting simply crumples. That does not happen, because you do not have to give away your calories. Doh - Turns Out That Weight Loss Can Be Easy If I was to tell you that weight loss can be easy I am pretty sure I can guess your immediate reaction. You would lump me in with all those hucksters that promise instant weight reduction through the application of the next big thing in dieting pills, or the latest Hydroponic Waffle Diet or some such nonsense. 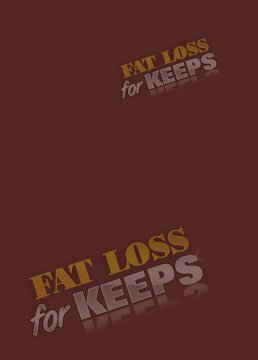 But after reading this book, "Fat Loss For Keeps": http://nickname.fatlossfor.hop.clickbank.net/ I can honestly tell you that the principles of weight loss are not only easy to understand, but they are not all that difficult to apply either. Sure, a little discipline is required initially, but that it true of everything we undertake that is new to us. The important thing is that Carolyn's theory of weight loss is not based on the idea of trying to remove food from your diet. Because that never works for more than a short period of time, and when you go back to your old eating habits you very rapidly wipe out any progress you had made toward your idea body weight. Instead, the idea here is to combine strength-training with a very balanced diet that involves small meals spread out over the course of the day. So instead of 3 larger meals, you make do with perhaps 5-7 small meals containing smaller portions. This she says is the secret to increasing your metabolism and burning off those excess fat stores. Well, I will leave it to her to tell you the full story, since she is the expert. You can find her book here: http://nickname.fatlossfor.hop.clickbank.net/ Again, it is called "Fat Loss For Keeps" and it explains how you can adopt a plan of action that helps maintain your health, increases the rate at which you burn off unneeded body fat, and keeps you on the straight and narrow not just for the immediate future, but permanently. Highly recommended. 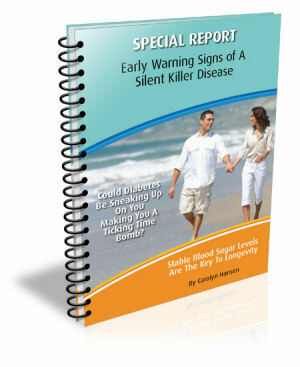 If you would like to offer your prospects a high-quality ebook on a theme closely related to fat loss, you can grab my Special Blood Sugar Report, and have your ClickBank affiliate link already embedded into the book so that you will be credited for the Fat Loss For Keeps referrals in the book. Better yet, you are not even required to download any rebranding software - your affiliate link is generated on-the-fly within the book before you even download it! Your target audience should be people who are interested in getting in shape using a set of techniques that promote weight loss in a sensible fashion at a sensible rate for long term sustainability. This is the audience for whom I have written, so you will get the highest conversions if you presell them on this notion of weight loss that they can enjoy for years to come.